Apple launched iAd in July this year at the WWDC 2010 and it’s showing the desired results already for the company. Latest figures show that Apple will be finishing with 21% of the market share in mobile advertising by the end of the year. Google will drop to 21% from last year’s holding of 27% and Microsoft, who was only just getting into ads, will drop to just 7% from last year’s 10%. 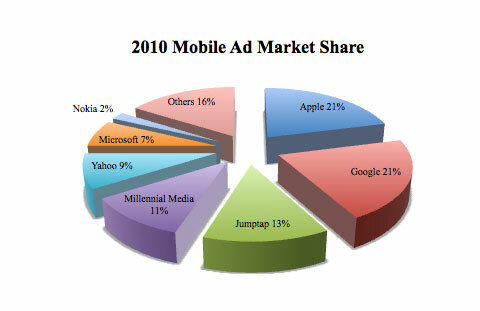 A large number of companies now prefer to advertise via iAd and have shown satisfaction with the results. Unilever who started advertising via iAd soon after launch in July say they’re “extremely happy” with the results of their ad campaigns. Rob Master, the company’s North American media director, said in an interview that more than 20 percent of people who click on Unilever iAds—which feature video and an interactive game—check out the ad a second time. Natalie Kerris, spokesperson at Apple has reported that the number of brands that use Apple’s iAd has doubled since July. Google and Microsoft aren’t the only companies losing the market, Nokia and Yahoo ad services have also seen a significant bump in business. Apple also benefited from buying Quattro Wireless earlier this year as the company had 9 % of the market in 2009. The move proved fruitful as Apple had generated $ 60 million in iAd commitments from marketers even before officially launching the service. The companies included electronics retailer Best Buy, satellite television service provider Direc TV and of course Unilever.